January being a time of new beginnings, it’s not surprising I’ve heard from readers and friends searching for the healthy recipes they once saved but now lost : ) I told them what I’m telling you: Keep it simple and feel free to experiment! 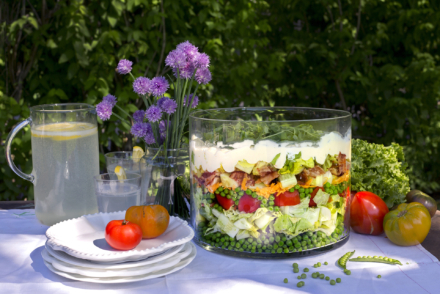 Some of my favorite daily put-togethers are salads that combine the varied textures and tastes of hot & cold ingredients, and, that don’t weigh you down with too much meat or fat. Which brings me to this bowl. A mix of peppery baby arugula, with the mellow smoothness of oven roast potato, onion and garlic, and crisp-oven “fried” brussels sprout petals on top, this dish also stars red quinoa which is gluten-free, and the only plant-based protein to have all nine essential amino acids. Pulling it all together? 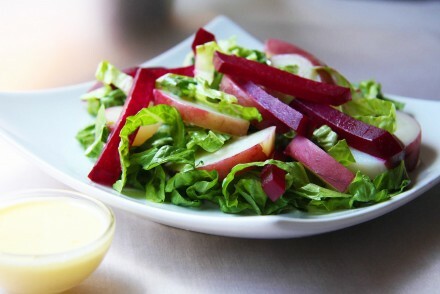 A drizzle of paprika-spiked tahini-lemon dressing. This bowl works very well at lunch. To make that easy-doable, prepare the quinoa & roasted veg the night before and then microwave quick-heat those ingredients when you toss the salad together next day. 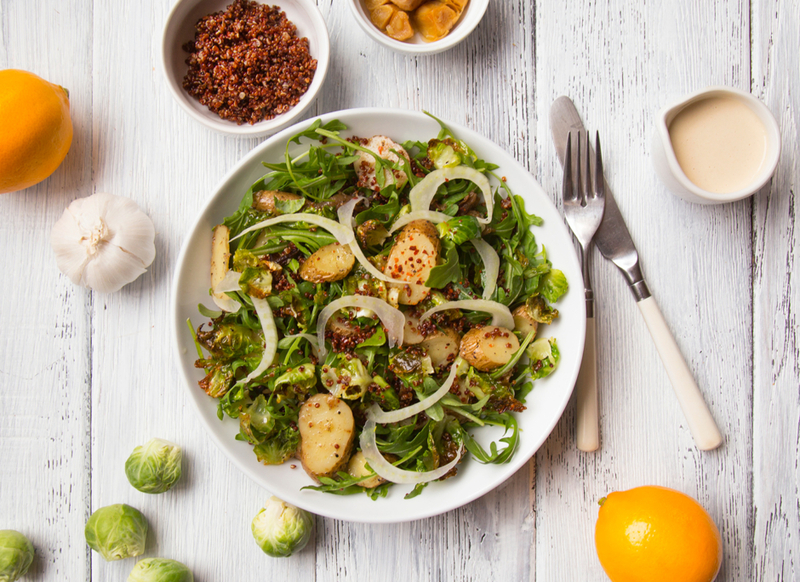 A mix of peppery baby arugula, with the mellow smoothness of oven roast potato, onion and garlic, and crisp-oven “fried” brussels sprout petals on top, this dish also stars red quinoa which is gluten-free, and the only plant-based protein to have all nine essential amino acids. Pulling it all together? A drizzle of paprika-spiked tahini-lemon dressing. Combine ¼ cup quinoa with ½ cup water in a rice cooker or over stove top. Simmer over low heat about 10 minutes until quinoa is tender and has absorbed the water. Set aside. Wash and then slice potatoes, skin-on, into 1/8 inch rounds. Spread potato slices on baking sheet. Preheat oven to 350°F. Drizzle potatoes with 1 Tbsp olive oil; toss to coat. Season with fresh-cracked pepper and salt. Set pan aside. In a small baking dish, sprinkle all of the red onion slivers. Drizzle with ½ Tbsp olive oil. Season with fresh-cracked pepper and salt. Add 1 tablespoon water. Cover baking dish with foil. Set aside. Cut an 8-inch square of aluminum foil. Holding this in your hand, nest the head of garlic in the center of the square, rounding the edges of the foil upward to make a cup, and then add two tablespoons of water. Twist the foil closed to make a packet. Place the foil-wrapped garlic on the oven rack along with the pan of potatoes and the dish of onion. Roast all for ½ hour to 45 minutes until potatoes are tender and golden, the onions are soft and caramelized and the garlic is soft. While the vegetables are roasting, separate and pull the petals from all of the brussels sprouts into a bowl, discarding the cores and center nubs of the sprouts. You will have 2 cups of petals (These shrink quite a bit as they roast and crisp). Toss petals with 1/2 tablespoon of olive oil, salt and pepper. Spread on small baking sheet. Set aside. 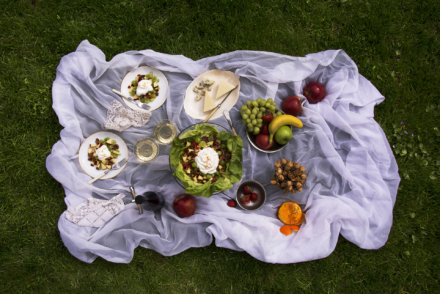 Make dressing: Whisk tahini with lemon juice—it will thicken. Add water and continue whisking until smooth and pourable. Add smoked paprika, salt and pepper and adjust seasoning to taste. Mix 2 tablespoons of the dressing with the reserved cooked quinoa. Set seasoned quinoa aside. Reserve remaining dressing. When the vegetables are finished roasting, remove all from the oven. Squeeze the garlic from the skin into a small bowl and mash with a fork until smooth. Mix the garlic and onion with the roasted potato. Set aside. Increase oven heat to 425°F. Place the brussels sprouts petals in the oven and oven roast for about five minutes until the petals are brown on the edges and crispy. Remove from oven. To assemble the quinoa potato bowls: Place 1 cup of arugula in each of two bowls. Sprinkle with the seasoned quinoa. Add more arugula. Spoon the roasted potato/garlic/onion mixture in dollops over the greens. Top with crispy brussels sprouts petals. Garnish with paper-thin slices of fennel. Drizzle with more of the tahini dressing. Serve with crisp flatbread, if desired.